Food and other good stuff for vegans in Auckland, New Zealand. 1. Vinyl on Dominion Rd has delicious falafel and tofu burgers on their lunch menu (pictured above: falafel burger). Best enjoyed with a side of curly fries. 2. Handmade in Kingsland makes two vegan burgers, based around either tempeh or falafel. Their burgers are generously sized, filled with fresh, simple ingredients, in a homemade style. 3. Burgerfuel‘s Combustion Tofu and V-Dub Vege burgers can be prepared vegan. Recently re-introduced to the menu, the Combustion Tofu is now a mini version of its older self. Its contents include organic tofu, teriyaki and peanut sauces, avocado and salad. The V-Dub is a bigger burger, with a pattie made from pumpkin, carrot, chickpea and ginger. If you’re hungry enough, you can also order Burgerfuel’s fries or a side of Motobites. 4. 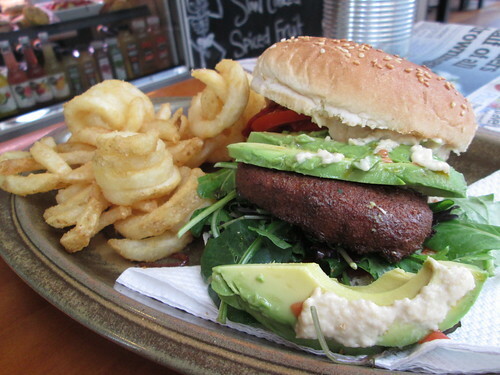 I haven’t had the tofu burger at Raw Power in a few years, but friends have raved about it. It’s a burger in the ’90s Auckland café tradition: a giant stack of things served between two pieces of foccaccia – more of a knife-and-fork affair rather than something you would pick up to eat. Do you know of other delicious vegan burgers in Auckland? Let me know in the comments. Hi, I'm Moira. I like to eat stuff that doesn't involve animals. I live in Auckland, New Zealand. write to Moira, P O Box 7754, Wellesley Street, Auckland, New Zealand. (See also: Google Map of vegan-friendly places in Auckland).